When I was a kid, I saw the movie Hellfighters starring John Wayne. 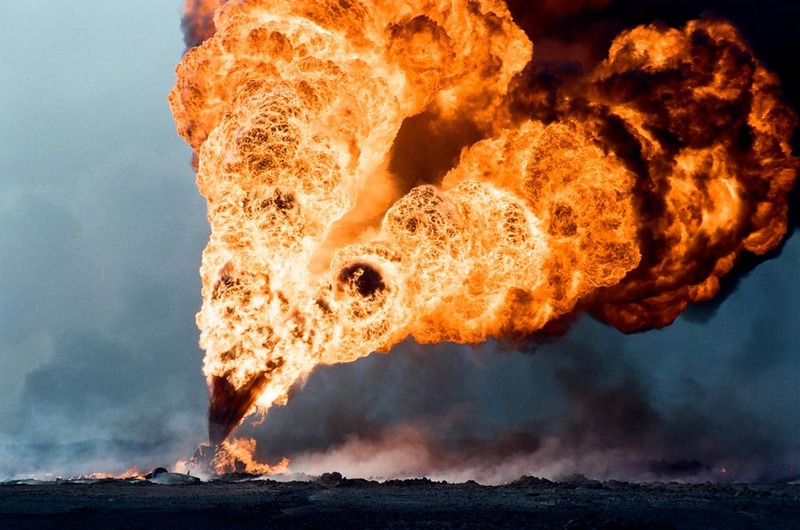 It was a film loosely based on the life of Red Adair and his team of oil well firefighters. I was a kid and any movie with fire and explosives was worth a look. Now, I find myself in Kuwait, where over 700 oil well fires were put out in a 7 month period by thousands oil well firefighters. That is not without its own allure. I never saw the movie Fires of Kuwait until yesterday. It is an interesting and short documentary on how they put out the 700 oil well fires that were started on the orders of Saddam Hussein as the Iraqi troops retreated in defeat after their invasion of Kuwait. These guys walked into the job thinking it would take 10 years to get all the fires out. 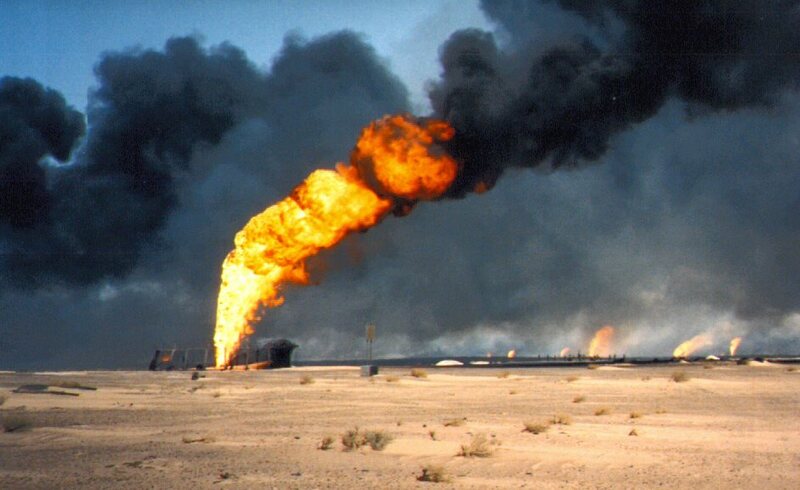 My first trip to Kuwait was after the fires had been put out, but I will tell you the country smelled like burning oil to me every time I went there for the next 3 years. So, click on the link and give the movie a look. By the way, they not only use explosives, they also use two jet engines mounted on an old Soviet T34 tank. Once again I found myself traveling to Bahrain on business. I have come to the realization that when I am in the Middle East during Ramadan for at least some part of it I have been in Bahrain. There's nothing special that goes on in Bahrain during Ramadan that is different than any other place in the Arab world but for some reason I always wind up on that island during that particular month if I happen to be in the area. Such is life. The trip was short and basically uneventful, my host took me to section of town that I had not been to before. If the temperatures (112°) and humidity (54%) were lower, I would've sworn that I was in Europe. This building in particular, used to style that I have seen in Italy. They cover a very plain solid wall with paintings to make it look like there are windows in the building. We ate at the La Cucina one evening, to me the name was Mexican sounding but it turned out to be a very excellent Italian restaurant. When I first walked down the alley to get to the restaurant, I could've sworn that the tower on the left was meant to be a homage . To the famous tower in Pisa – – when in fact, it is a mosque. In keeping with the Internet trend of taking pictures of your food I give you a picture of the Pepper Steak that I had at Coco's. It was excellent. Because of the serious humidity and heat in Bahrain when I boarded the plane to leave, I encountered a thick fog inside the plane. The airline was trying desperately to keep the plane cool and comfortable and as a result this fight over environmental control caused thick condensation to float in the air throughout the aircraft. It was kind of spooky. The taxis from the airport, are only driven by Kuwaitis. So, when I come back I can usually look forward to a brief conversation with a native. This time was no different as he quickly got me from the airport to my home. The fares are all predetermined based on the destination and are displayed on the window in both English and Arabic. As I prepared to exit the cab, the driver quoted a fare that was twice what I knew the rate to be. When I pointed to the rate chart that was clearly displayed he acted like he had forgotten that such rates existed and apologized for his mistake. I handed him the exact fare, choosing not to tip because you try to rip me off. That was the first time in all my dealings with Kuwaitis that I have ever had one try to do something under the table like that. Finally, I got another haircut (where does the year go?) and opted for something a little more Tony Starkish on the goatee. Not sure how long it will last because it requires a lot of work to keep it trimmed properly, easy for him since he has Pepper and Jarvis to lend a hand. This sign caught my eye. They display the picture of a Duck, for a place that has Cat and Coot (a cranelike bird) in the name, which is selling shwarmas, a type of Middle Eastern sandwich that is usually made of chicken or lamb. I'm confused. Notice that the man pictured in the sign is not wearing a gutra (Arabic head dress), that is because the sign is specifically aimed at Indians and Pakistanis who live and spit in the area. This tour to the South Tyrol region of Northern Italy was something new. The first stop was Vipitino. Within the town, we were taken to a wine and leather goods shoppe to do some shopping. Was a very nice place and we got to sample a few different kinds of wine and liqueurs. The worst part was that because I was going back to Kuwait it would do no good for me to do any shopping for things to take back with me. After we were done in that store we wandered the narrow alleyways through the town looking at the various small shops along the way. 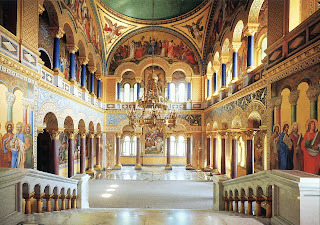 While we were there we also visited the church which had a beautiful display of Gothic artwork on its walls. Most of them dealt with the subject of the wages of sin, John Milton would’ve been impressed. The next stop was Bolzano. It was a beautiful town and we had a great lunch there before going to museum to visit Ötzi. 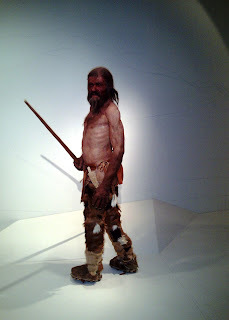 At 3500 years, Ötzi is the oldest wet mummy ever found; he was discovered by some hikers when some flooding melted a section of a glacier up in the mountains. As a result, Ötzi ended up with his own museum and a study of everything he was carrying and the body left behind. Their best guess is that he was some sort of shaman since he was carrying those types of objects. 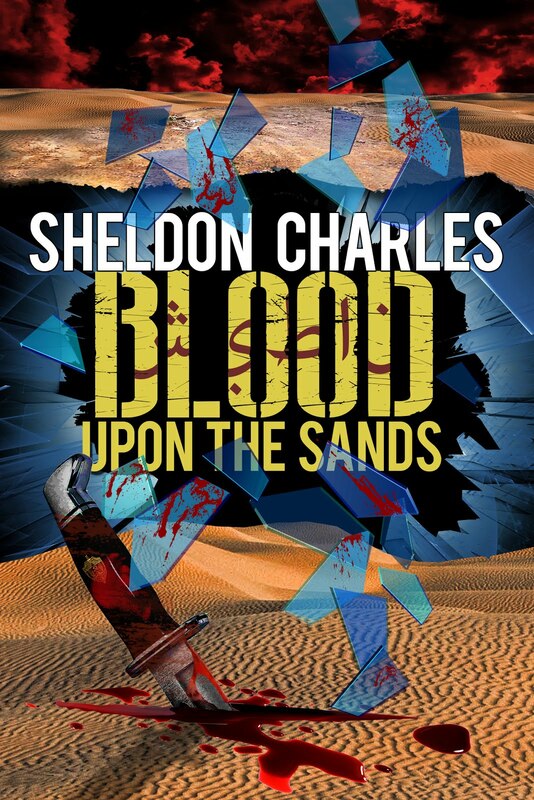 He was murdered, being struck from behind by an arrow that caused him to bleed fatally. I felt no danger form that because I’m fairly sure whoever did it is no longer hanging around. After a visit to visit to the museum, and watching a few street performers, we went back to Walther Square and enjoyed the afternoon sun with a cup of coffee and some gelato. The square is named for Walther von der Vogelweide, a German minstrel. 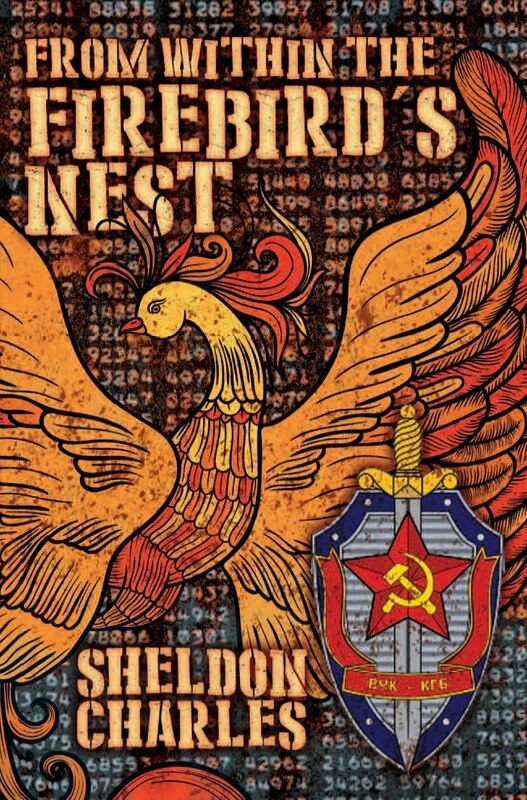 The name of the town might seem familiar to you if you are a student of World War II, as you might’ve heard about it in association with Odessa or Nazi war criminal Michael Seifert who was a guard at the concentration camp there. Seifert was located, arrested and tried in 2000. During WWII the town was the site of a Nazi transit point for political and other prisoners. Just after the war, it was used as a transit point for Nazi officers who were attempting to escape to South America. While we were there I saw nothing to acknowledge any of these events. The tour of the Salzbergwerk is something we had done before while we were stationed in Germany. I am not sure of anywhere else in the world where you can go on a tour of an active mine. It is located near Berchtesgaden, so we had all a rather lengthy drive in the pouring rain through the mountains to get to there from Garmisch-Partenkirchen. First they dress you up an appropriate clothing, then you board an actual mine train and head deep into the mountain. On our prior trip we wore what were once actual miner’s clothing but these have been replaced with easy on/off coveralls. While walking through the mine, they tell you all about how salt is extracted from the huge deposits that exist under the mountain. You get to go down huge wooden slides that were once used to transport the salt rock within the mine and you take a ferry across a huge underground salt lake. It is all very interesting and educational. At the end of the tour, they give you a sample of the soul to take home with you as a memory of the day. I wish we had been able to go to the Eagles Nest again, but apparently they no longer conduct open tours there as it is been converted into a restaurant. Bummer. Sometimes, you never find that one place that you are looking for while on vacation. In the states it might be Bob's Reptile World and Snake Emporium, in Garmisch for us it was Kletterwald. From the day we arrived, we heard about a rope and zipline course going through the woods in the Partenkirchen section of town. We would even see the occasional sign for Ketterwald as we went about town but never really saw the course itself. On our final day there, the sun was shining and we decided to find the course and spend a few hours exploring it. 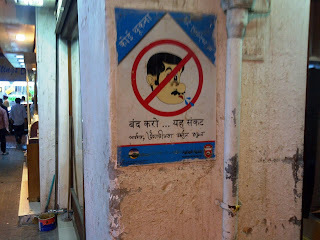 We followed every sign that we could find, including the very last one we saw which pointed us up into the mountains. We spent hours exploring the various roads and never getting anywhere. Before you ask, yes we checked the map. It was hopeless. But now we have a perfectly valid reason to visit again. In the end we gave up and played a round of mini-golf -- something else I'd never done before in Germany. The 10 days we spent in Germany were a blast. It was so great to get out of Kuwait for a while and to escape to someplace so beautiful and welcoming. Now I am back at work again with only one more break in my tour look forward to, in September I go back to the US for a few weeks. When I return from that one, I’ll be counting down the days until I pop smoke and GMX. One evening we went for a brewery tour at the Griesbrau brewery in nearby Murnau I had seen large American breweries before, like Anheuser-Busch in Williamsburg Virginia, but I've never seen a smaller German brewery. Our tour guide' s name was "Not Wolfgang". We were originally supposed to be given the tour by Wolfgang but this gentleman replaced him and for whatever reason I failed to get his name. Therefore, for the purpose of this blog I will have to refer to him as Not Wolfgang. We were first taught about the German Purity Laws (beer is very serious business in Germany) and then Not Wolfgang moved on to how beer was actually made. Along the way we sampled various product that was being produced by the brewery. One product that we did not get, was the recently released "Dragon's Blood" which based on the name everybody wanted to try. We also got to sample the beer liqueur that they are known for around the region. I had drunk several shots of the liqueur previously, but this time I was drinking and at the source. It is served warm to hot with whipped cream on top. Tasty. Once the tour was complete Not Wolfgang gave us a test on what we had learned. It did not take too long for it to become a group effort and several people used their translation skills to pull the answers off of the menus that were on the table. Luckily, everyone passed and Not Wolfgang handed out diplomas. 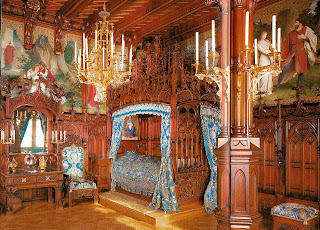 I always wanted to go into the cream colored castle across from Neuschwanstein but when we had visited the area, it was not open to the public. This time, things had changed. 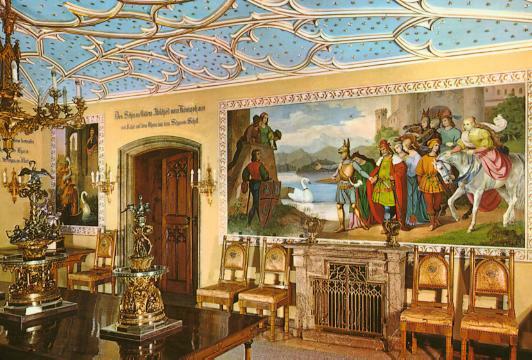 The castle, Hohenschwangau, had previously been lived in by the family that owned it. Between my last visit in 2006 and now, the family had moved out and turned it into a tourist attraction. I'm so glad that they did. 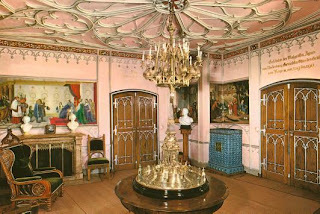 I cannot show pictures from the inside of the castle, because they won't allow you to take them -- although I did find a few on the web that are shared here. 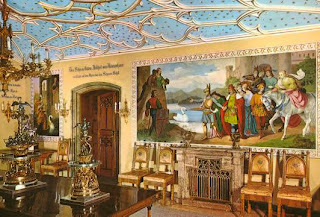 However, the most unique thing about this castle is that the artwork that was produced for the castle was not hung on the wall or painted onto canvases that were pasted the wall. 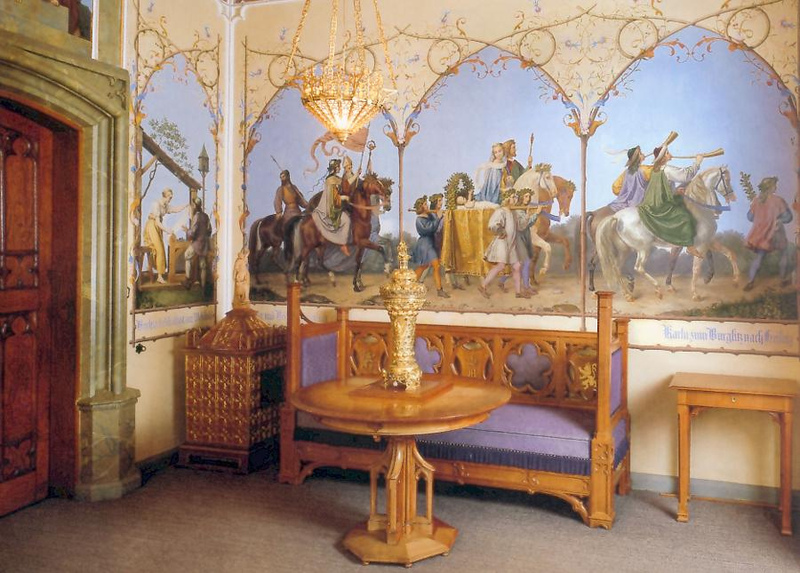 Instead the scenes were actually painted onto the walls with the original paintings being tucked away for safekeeping. 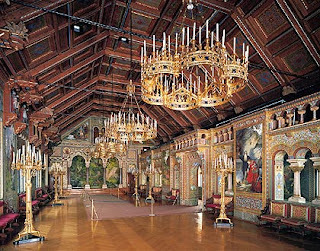 Also, a majority of the paintings were not of the royals themselves but of scenes from various historical events and German legends. 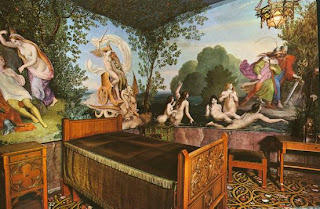 The walls in all of the rooms were covered in Renaissance style storyboards which could be appreciated for hours rather than just the few moments that we were given to enjoy them. After touring Hohenschwangau we walked across the street and boarded a horse drawn carriage for a ride up to Neuschwanstein. If you have seen the Disney castle, this was the model for it, although no one will admit it due to copyright rules. No pictures from the inside of this place either, but you would be impressed. 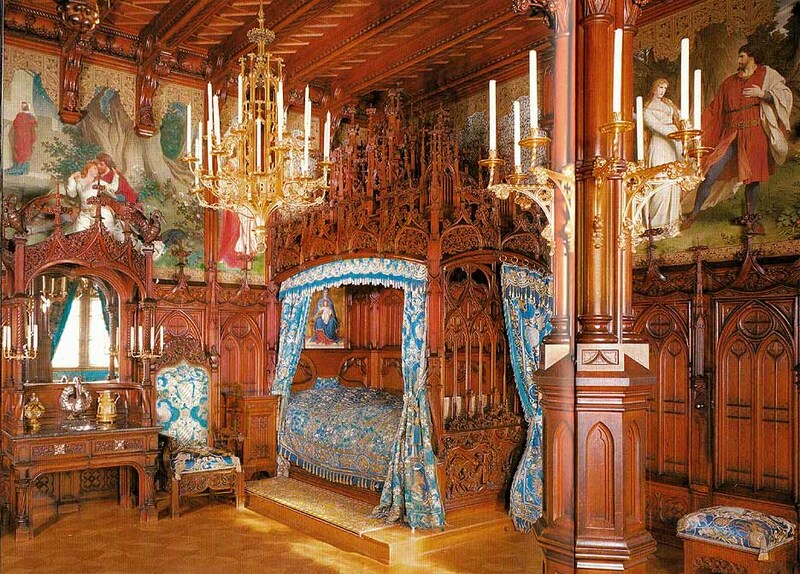 Ludwig's bedroom alone took 14 woodcarvers 4 years to complete. 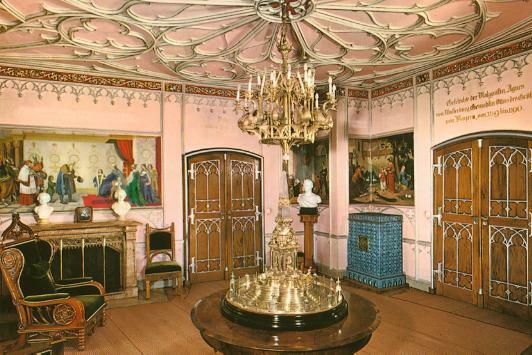 I was able to find a few pictures of some rooms on the web. Bavaria has always been my favorite place to go in winter. The skiing is terrific and there are so many other winter sports available in the area it is feast of activity. During my final year of being stationed in Germany, my son and I went skiing near the peak of the Zugspitze, the tallest mountain in Germany; but this time we were here in summer. The Bavarian's are very inventive people and during the summer they convert bobsled runs into rottelbahn runs. Basically, you remove the ice and snow and replace the bobsled with a modified cart that has wheels on it. Voila! Summertime ride. This footage was shot by my son has he rode the SommerRottelBahn track in Garmisch. Occasionally, in the background you will get a glimpse of the ski jump that was used in the Olympics in 1938, as well as yearly for the International Ski Jump Championship. No speeding in your tank. There are laws.